Eijun is nervous about rooming with older teammates, but they make him feel a too little at home on his first night. Eijun ends up oversleeping and shows up late when it’s time to meet Coach Tesshina Katoka, a former Japanese pro pitcher. Miyuki also shows up late, but he uses Sawamura as a decoy to sneak into his line. Katoka shows no mercy and says Eijun can never become a pitcher if he can’t show up on time. He also makes Miyuki run laps. 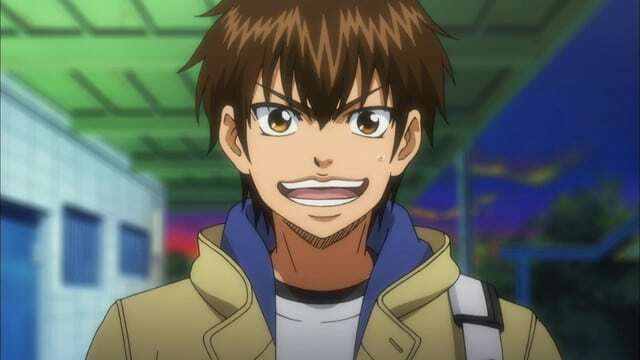 Sawamura is determined to prove he can be the ace though, so Coach Katoka gives him a special challenge, saying until he can complete this challenge, he can’t play in a baseball game for Seidou.